At some point, you may find your board gaming group seeking a “next level” board game. Something that can provide you with hours of immersive and thematic gameplay, that contains enough decision making to make it feel like a skill-intensive experience, but not at the expense of fun. And of course, you’ll want something you can play over and over while still getting a new experience. 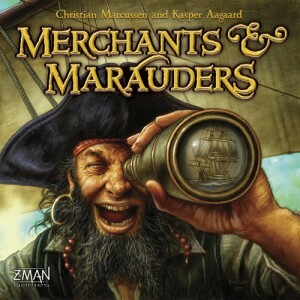 If your group is ready to take this plunge, or if your just looking for the ultimate “pirate” board game, you should consider Merchants & Marauders. The game is played with 2-4 players, and is based around sailing your fleet of ships between ports to trade goods and obtain quests for victory points. Each port of the Carribean has unique attributes, and have allegiance to a particular European monarch. You may also encounter merchant or military vessels while sailing, which you can choose to attack, but you will become wanted in the ports of that ships nationality! Players must carefully decide how to go about seeking their fortunes, considering the available quests, most profitable ports, and unique attributes of their captains and ships, which can be upgraded. We’ve only scratched the surface of all the depth this game has to offer, and for the truly master-level gamer, there is an expansion set with even more ship upgrades, character cards, and questlines. The first time playing, you should be prepared to spend most of the night just learning the rules. But once you get over that first game, your in for an endlessly replayable experience that will make you feel like a true 16th-century swashbuckler every time. YAARR!